Show & Tell regular, Lynda Abbott, known as Vestaswind and a blogger at Appraise Your Junk, piqued our interest when she posted a couple of great vintage “talking boards” from her collection. She explains, “My obsession with Ouija really started in 1999, when Parker Brothers stopped making the old boards and went to the glow-in-the-dark version. 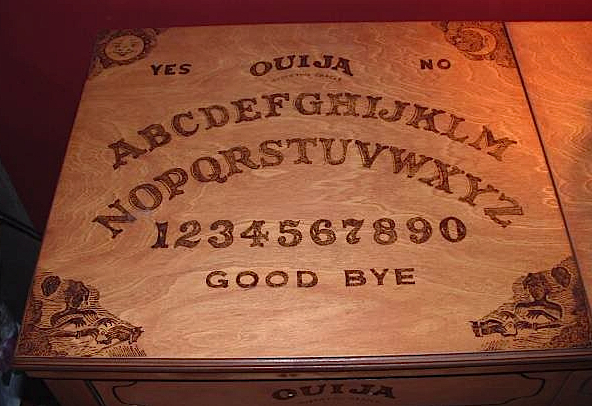 It was an end to an era, making even the newest of old Ouija boards in demand. Other means of talking to ghosts were much more inefficient, requiring taking down notes from Morse Code-like knocks, taps, and rattles of a shaking table. It wasn’t long before crafty inventors came up with devices that let supposed spirits leave alphabetic messages much more readily. Those included dial-plate instruments, psychographs, and, finally, talking boards. Another legend, found in the same article, says the same year, Charles W. Kennard, a Chestertown entrepreneur who had previously started ventures in fertilizers and real estate, “sat idly in the kitchen of his Maryland home. … In this blissful state he reached out and took his wife’s breadboard and placed it on his lap, and then placed a saucer on the bread board. The saucer began to move, as though on its own volition. Mr. Kennard was amused, frightened, interested, impressed, inspired and delighted. He saw both spooks and commercial possibilities.” Yet another article, appearing in the New York Daily Tribune in 1886, says the handmade “talking board” craze was spreading across Ohio, four years prior to its supposed invention. In fall 1890, Kennard went into business with fellow Masons Harry Welles Rusk, William H.A. Maupin, Col. Washington Bowie, and John T. Green as the Kennard Novelty Company in Baltimore. Early in 1891, Kennard and Maupin acquired the rights to the first U.S. talking board patent, registered by Elijah J. Bond, and sold their interest in it to the company. It wasn’t long before Bowie dismissed everyone but Rusk, and put his close pal William Fuld in charge of the renamed Ouija Novelty Company. Some might call this a hostile takeover. Kennard went on to patent and manufacture other talking boards, including the Volo (1892) and the Igili (1897), and other knockoffs soon followed. Over the decades, these often were printed with mystical images of pyramids, swamis and exotic locales or Halloween-themes like black cats, witches, and devils. Abbott explained to me that Fuld also liked to brag he invented the Ouija. However, even before the Victorian craze of mysticism, similar talking boards had been in use much longer, the origins dating back centuries in China. In fact, some ancient Daozang scriptures are thought to be derived from “automatic planchette writing” or “spirit writing.” Be that as it may, Fuld was clever enough to notice the trend and capitalize on it, which paid off handsomely. If you believe that Fuld was actually taking instructions from his Ouija board—and not just hyping his product—you might be inclined to think an unfriendly spirit was giving out the orders despite his financial success. Fuld ended up in a long and bitter business dispute with his brother, Isaac, over the production of the Ouija board. Even his 1927 death is shrouded in mystery. One account states, “William Fuld was tragically killed by complications falling from the roof of his three story Harford, Lamont, and Federal Street factory. The iron support he was leaning on gave way, and he tumbled backwards off the roof.” However, some suggested the fall wasn’t an accident at all, and possibly suicide. In particular, those who believed the boards to be evil thought “the devil’s oracle” drove him to it. After this death, the Fuld family held the patent until they sold it to Parker Brothers in 1966. In 1940s, companies like Haskelite Manufacturing Corporation, Gift Craft, and Lee stepped into the void, producing the Egyptian-themed Hasko Mystic Board and Mystic Trays, the Swami, and Lee’s Magic Marvel. I have to admit I had not seen this. All I can say is Wow! All in all I’m not surprised by it however. Still the Ouija has caused controversy from it’s birth. Fuld would of been happy with the free adverstising! I’ll have to get one before they are gone! 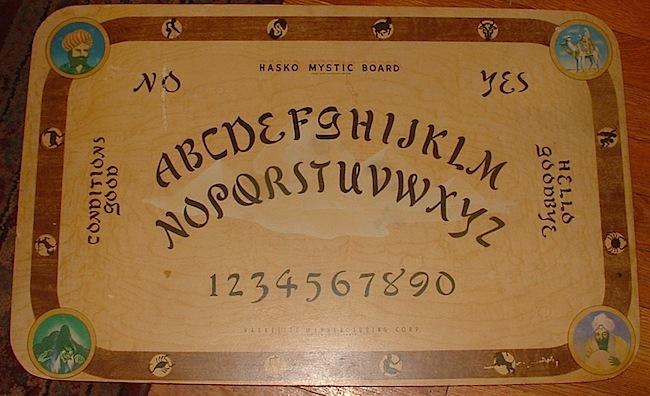 I have used different vintage Ouija boards for several years. 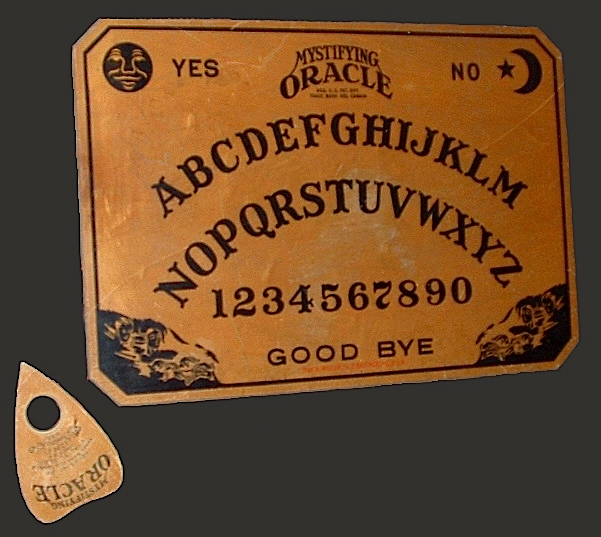 Recently, I purchased an original 1891 Kennard Ouija board and original paddle planchette (120 years old and full of energy) and tried using it the same way I use my other boards. The energy is too intense, and I have tried several times to calm the boards energy to use and get results. It’s a little frustrating, because I consider myself an intermediate practitioner using Ouija boards. If there was something I could do to enable the boards capabilities, I would try anything. Any suggestions? If I can’t use it at all, I’d rather sell it to someone who has more experience than I that can tap into its powers & get better use out of it. I have watched with amazment as two of my friends used a brand name store bought board which led to some creepy activity one evening. First they asked the spirit if it was in the house. Yes. Where are you spirit? In the bell. Where is the bell? Master Bedroom. After searching the largest bedroom which I didn’t sleep in to no avail of finding a bell, I suggested we search my bedroom since I was the Master of the house. In the closet buried in a paper bag far in the back was a ceramic plaque of the Liberty Bell which I had not seen in many years. Is this the bell? Yes. From then on the spirit would answer no more questions. The board was taken over by another spirit which they had encountered before. That board has since disapeared, but I’ve always been interested in fashioning a custom one.